Recently there has been a lot of buzz about the physics of ponytails. An article published this week Physical Review Letters used statistical physics to show mathematically what every girl with a bad hair day already knows; the shape of a hanging ponytail. We here at Buzz headquarters wanted to see if our ponytails were doing what math says they should be. Hair is complicated. It is bouncy, elastic, curly, straight, thick and thin. Most people know that it also has a tendency to stick out in many unfortunate directions. Using statistical methods, Goldstein et al derive a simple equation that takes all this into account yet very accurately describes the shape of a ponytail. In their experiments they used switches of hair from International Hair Importers & Products. I can't imagine the look on accounting's face when they saw that on the company card! Though their equation very accurately describes their disembodied "switches" we were wondering how they would stack up to some hair that was still attached to a head. We have one straight, long, ponytail, a curl, long, ponytail and a short, thick, ponytail. 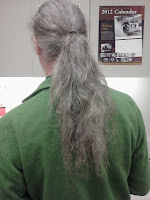 Oh yeah, and one, um, non-traditional ponytail. The paper begins by making many assumptions about the average human hair including its thickness, strength and elasticity. These should be about the same for our ponytails. They do, however, make an assumption about the curl of hairs based on their personal "switch" samples and this is probably not the same for some of our "samples." Seeing as we do not have the equipment to measure this for our own personal hair, I'm going to leave it alone and see how close we get anyway. 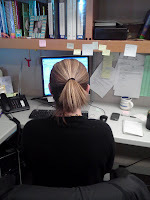 Our first ponytail has a total length of 11'' or 28 cm. The one dimensionless parameter mentioned in the paper is the "Rapunzel Number" which is the length in cm divided by 5cm. This ponytail has a Rapunzel Number of 5.6. 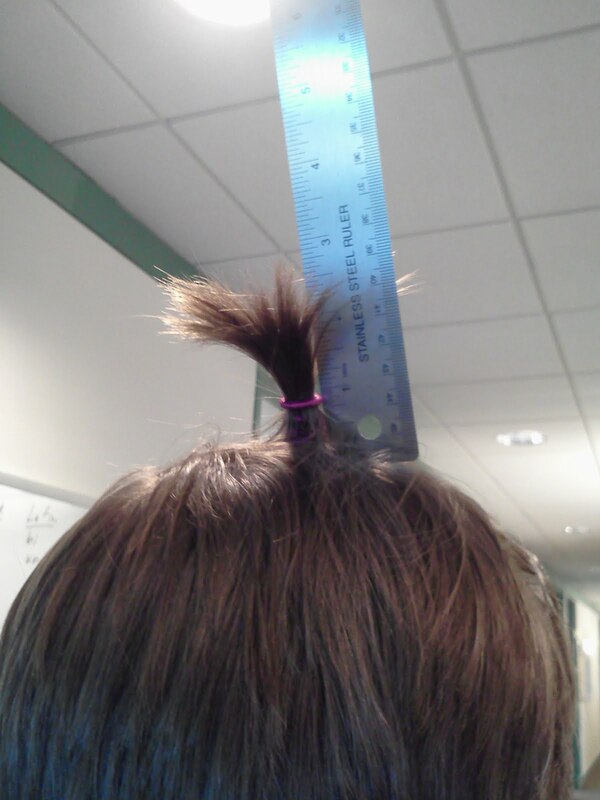 According to the team's predictions, at 10cm, the ponytail should have a radius of a little over 3cm and at 15cm it should have a radius of a little over 4cm. In the first case, at 10cm this ponytail has a radius of close to 3.2cm. Ok, so far so good. At 15 cm it is about 3.9cm. Wow, closer than I would have thought! Now on to a short, thick ponytail. Before I start this analysis, by looking at this ponytail I thought there was no way it could agree with the predictions. It looks too different from the previous one. This ponytail is 12 cm long with a Rapunzel Number of 2.5. At 5cm it should have a radius of a little under 2cm. Turns out it is a whopping 4.5cm. More than twice that predicted. This may be due to a fly away hair or the fact that the hair is a bit layered. Moving on to 10 cm and a predicted 3 cm. It is actually 5cm. It seems that for short, thick hair their predictions and/or assumptions begin to break down. Now for a long, curly ponytail. This ponytail tops out at 35.5 cm and a Rapunzel Number of 7.1! 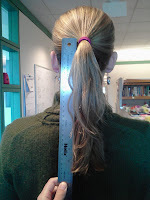 Since there is so much hair, we can do three measurements on this one! At 10cm the predicted radius is again roughly 3cm. Its off by almost 2cm at 5cm. For 20cm we should get a 5cm radius but instead we find its 9cm, almost a factor of 2 off. For 25 cm we should get a radius of just under 6 cm. Again, we are way off with a radius of around 10cm. Here is our "non-traditional" ponytail. Since Goldstein et al included gravity in their calculations, lets see what happens with it working in the wrong direction. The Rapunzel Number here is only 0.9. I don't have much to measure here, so looking only at 2.5 cm, we get a radius of 1 cm which is, well, just about dead on. Keep in mind that all of this was done for fun using a cell phone camera for the pictures and simple pixel counting for the lengths. There are huge errors in our calculations. 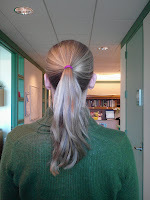 But, I would be willing to say that while the ponytail predictions are good for "well behaved" ponytails such as the first one, they are far from able to predict the majority of ponytails. Guess they will have to spend some time in the gym watching the girls on the treadmills. I'm pretty sure there are worse labs to be in than that. There was one overlooked fact in this paper that I found incredibly interesting. When hair dries it goes through a glass transition as it is drying and because of this your hair will "lock" into whatever shape it has as it goes through that transition. Its kinda cool to know why sleeping in curlers works better than a curling iron. Who knew! I read out interesting little science news snippets to my six year old, and then explain the background a bit. For this story I've been trawling the net to find one person who has read the paper, or some glimpse of the equation, so I could actually understand a bit myself before talking about it. (Buying the article for such a whim as mine is out of the question, sorry!) But you, I think, are alone in having read the paper and applying it too! Thanks. Thanks! I had a fun time reading the paper. I only put a bit up on the blog, but if you want more info on the actual paper or the equations, contact me through the physicscentral.com website and we can talk. I think it is awesome you read this things to your six year old! Thanks! I would love to know a bit more. I have recently started doing this, with the idea that funny or apparently silly (last week's was sea cucumber poo) news can be a starting point for a gentle lesson in basics of science, with animations, videos, games and experiments thrown in whenever possible. I don't expect this learning to stick for long, but hope that the fun and curiosity will remain, and perhaps when it is actually taught in school, it will mean something more than words in the book. For this news, I was going to talk a bit about hair - how it is made of proteins, and is actually dead etc., and then go off to how we can think of something as simple but the physics is complicated. On the lines of your experiment, perhaps get all ponytailed friends' measurements and record that... And oh, a little video about how Rapunzel's hair was animated, how all that we see on screen actually comes from maths and physics. I'd love to have the real equation and see if I can use it for our experiment. Could you write to me at www.contactify.com/383df please? I'll get back to you at the email you provide. I couldn't find your contact details at physicscentral.